Black holes are always hungry and apparently don’t care about good manners. Black holes destroy everything that comes in their path. 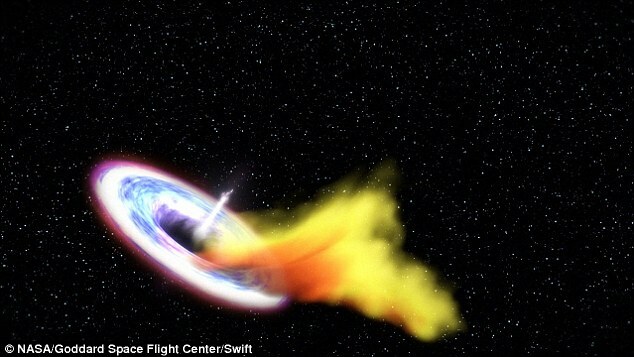 A team of astronomers have spotted a massive black hole swallowing a whole star. This particular massive black hole is also 'burping' a faster-than-light jet of matter into the cosmos. The thermal energy of these speedy exhausts is believed to be equal to the energy our sun would produce over next ten million years. This black hole is located in the center of Galaxy PGC 43234 -300 nearly million light-years away from Earth. It has a mass of approx. one million times the sun, but is essentially lies in a lightweight category of the super-massive black holes' family. Despite that, its gravitational tide was tough enough to swallow the doomed star, whose size was similar to our sun's. The black hole was first caught in the act of devouring a star back in December 2014 by Ohio State University's scientists by means of an optical telescope in Hawaii. Van Velzen's group - which involved astronomers in Oxford - then decided to use radio telescopes to keep track of the happening. After merging data from their telescopes with those from other telescopes - observing optical, radio and X-ray signals - the astronomers were able to assemble a 'multi-wavelength' image of the event. Astronomers had long speculated that when a black hole swallows a star - or any massive quantity of gas - it would emit a fast-moving stream of plasma from its opening, also known as 'event horizon.' Until now, however, the hypothesis had never been verified by direct observation. The main reason behind all this was that black holes do not consume stars very often. The unusual few cases formerly observed had also occurred in galaxies much farther away than PGC 43234, making observation tougher. As stated in the journal Science, the scientists' first step was confirming that what they had seen was not just matter spilling out from the black hole's 'accretion disk' - a whirlwind that forms around black holes when they are pulling material from space. Once verified, they were certain that that powerful radio discharge was certainly a 'jet' resulting from the absorption of a confined star. Van Velzen said, "The destruction of a star by a black hole is beautifully complicated, and far from understood. From our observations, we learn the streams of stellar debris can organize and make a jet rather quickly, which is valuable input for constructing a complete theory of these events."